There’s currently a shade battle going on between actress Lily Afe and Gifty Powers and Tonto Dikeh is right in the middle of it all. Just hours after former Big Brother contestant slammed the actress, she’s up with a major comeback. Lily who wouldn’t accept defeat has fired back at Gifty. According to her post, she has reportedly offered to give Gifty an oppurtunity to feature in her next movie which can help affect her career positively . 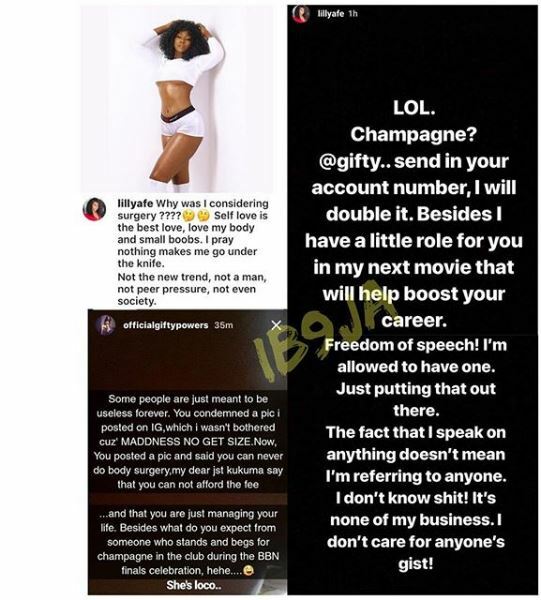 She also added that Gifty should send her account nymber and she’d double the sum of the champagne she claimed she begged for in the club. She further added on her post that she is entitled ‘freedom of speech’and she is not interested in anyone’s gist.